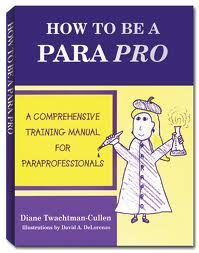 How to be a Para Pro by Diane Twachtman-Cullen. A comprehensive Training Manual for Paraprofessionals. The book includes examples, anecdotes and practical strategies. It also has four categories of educational support, reproducible data and record keeping forms, bottom line statements, and more. Pp. 200.